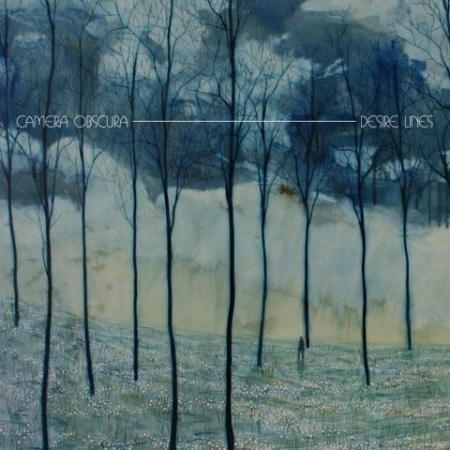 Although they're a popular and acclaimed outfit in their own right, it's fair to say Camera Obscura's career do date has been dominated - and to an extent undermined - by constant comparisons with another member of Glaswegian pop's elite. It's an association that's haunted them ever since Stuart Murdoch handled production duties on debut LP Biggest Bluest Hi Fi, to the extent that you'd be hard pressed to find a single review in the past 12 years which doesn't make use of the words "Belle and Sebastian" - this one now included. In fairness, the parallels are understandable, especially after Murdoch and company's mid-'00s radio-friendly makeover, but it's still an unread and rather dismissive method of evaluating a group who over the years have done more than enough to carve their own sonic identity. Perhaps this lack of recognition on their own merits operates at the center of Tracyanne Campbell's mind when stating her new year's resolution is "to write something of value;" a lyrical claim which opens the fifth, and probably finest track on her band's latest full-length. A wistful semi-ballad of almost inexpressible charm, the song finds the singer's yearning voice wrapped in a dense, consolatory bed of synths and emotive guitar licks, and perhaps does more than any to highlight the key elements which set Camera Obscura apart from their spiritual forebears. Whereas both acts purvey an enchanting, somewhat whimsical brand of guitar pop, and have regularly been attributed the dreaded "twee" tag, Murdoch's writing has always been built around characters and themes of dreams and adolescence. By contrast, Campbell's songs pursue well worn topics such as love and heartbreak, yet present them within a truly one-of-a-kind classic template that's high on both retro vibes and traces of romanticism. Perhaps the most obvious display of this approach comes in "This Is Love (Feels Alright)," a delightful moonlight waltz which effectively opens proceedings in a sea of sax and electronic subtleties. It's not wholly indicative of Desire Lines overall direction (less innocent, and more direct cuts such as "Troublemaker" and "Do It Again" instead tend to take center stage), but what it does do is provide a gorgeous exhibit of the immensely tasteful and alluring niche in which they're now well established. That formula is again found excelling on "Break It To You Gently," a seemingly effortless prime-time nugget which houses one of their most polished radio-ready choruses. Truth be told, that particular number stands out like a beacon in a second half that's largely Camera Obscura by numbers, an issue which plagues the record and prevents it from being the emphatic singing and dancing success many will have hoped for after a four year absence. Still, for every uneventful slumber like "I Missed Your Party" there's almost always a moment which showcases precisely why Campbell and her troupe have become a Glaswegian institution in its own right. Indeed, with Belle & Sebastian still on their own extended break, and newer Scottish pop sensations like CHVRCHES still finding their feet, this could be an ideal time for Camera Obscura to shine, and in fits and starts Desire Lines finds them doing just that.